Turmeric tea, benefits and research! Have you noticed all the kinds of turmeric tea on the market? Quite in contrast to the qualities. Find 11 different varieties of turmeric tea, click here. Teas with turmeric have become extremely popular in the last couple of years and now you will find several teas with turmeric. Highly anti-inflammatory. Read about anti-inflammation in this study from US National Library of Medicine, paragraph 2, click here! Fighting degenerative processes in the brain. Read about memory enhancement in aged rats in this study from Biogerontology, click here! Inhibits growth of cancer cells. Read about the anticancer potential of curcumin in this study from University of Texas M. D. Anderson Cancer Center, click here! Anti-depressive effects. Read about antidepressant activity of curcumin in this study from University Institute of Pharmaceutical Sciences, click here! Anti-aging. Read about potential anti-aging effects of curcumin in this study from Nencki Institute of Experimental Biology, click here! All of these studies suggest that turmeric has a potent effect in a variety of disorders and symptoms. But it is also clear that more research is needed! While waiting there is no doubt that turmeric is healthy in the right quantities. Due to the wide variety of uses, the turmeric market has been absolutely booming of late. For other turmeric supplements, such as e.g turmeric pills, have a look right here! Turmeric Root (40%), Suoi Gang Green Tea (20%), Licorice Root, Cardamom Pod, Lemon Verbena Leaf, Lemon Vana Tulsi Leaf, Lemon Essential Oil Flavour (6%), Lemon Whole (6%). 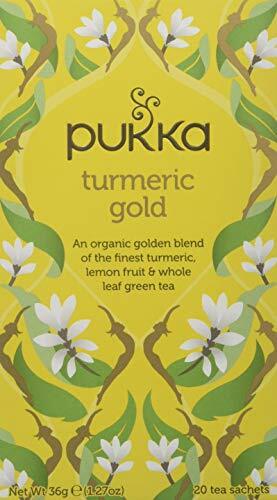 This tea has a warming not too strong turmeric taste and a nice light lemon flavour so I think most people will be able to drink it. Maybe even like it. Turmeric root (60%), ginger root, licorice root and rose. 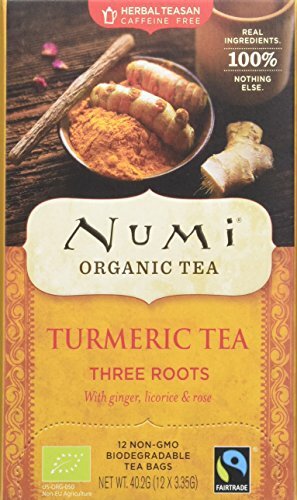 The taste of Numi’s turmeric tea is very powerful and warming. 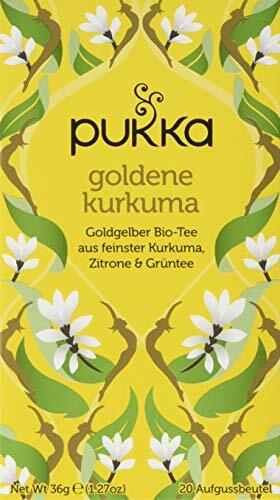 Definitely having a stronger turmeric taste than Pukka’s Turmeric Gold. Numi has created four different turmeric teas, so it should be possible to find a variant you like. Do you prefer organic food and drinks just like me? Do you also love to taste a lot of organic tea? And see what the market has to offer on organic teas? These three things made us create our website – https://organic-tea.org/ – with only organic tea. Have a look right here! We missed a place where to browse and search for high quality organic teas with easy-to-understand descriptions. It is easy to find organic tea at Amazon (at least all the largest tea brands), but in our opinion the page is crowded with advertisements and you have to scroll up and down to get to the ingredient list and description. This isn’t necessary at organic-tea.org.